Do you ever wonder where hotels, farmers markets and restaurants get their fresh, local produce and fresh seafood? Or who is growing the healthy greens, fruits and other veggies in which we all indulge? Have you ever wondered which farms offer tours or which ones have their own farm stands? Looking for the current locations of our farmers markets or a place to buy fish and crabs off the boats? Want to indulge at our local wineries and breweries? 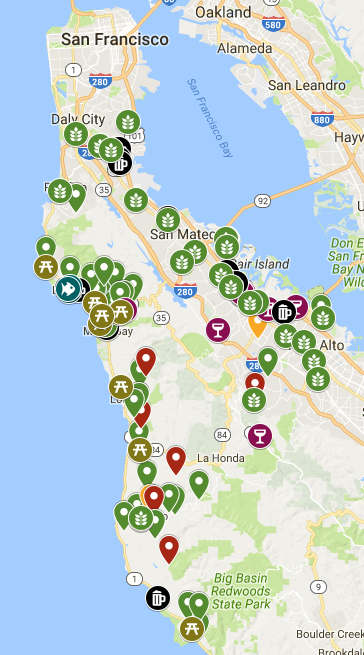 If your answer is yes to any of the questions above, here is a google map with the farms, docks, wineries and breweries in San Mateo County. You’ll find the full list on this map.